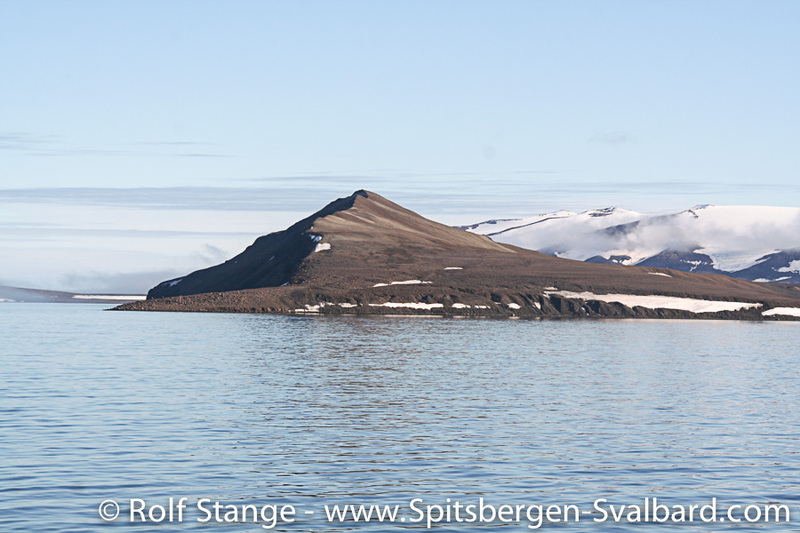 General: There is a large number of smaller and some larger islands in Hinlopen. 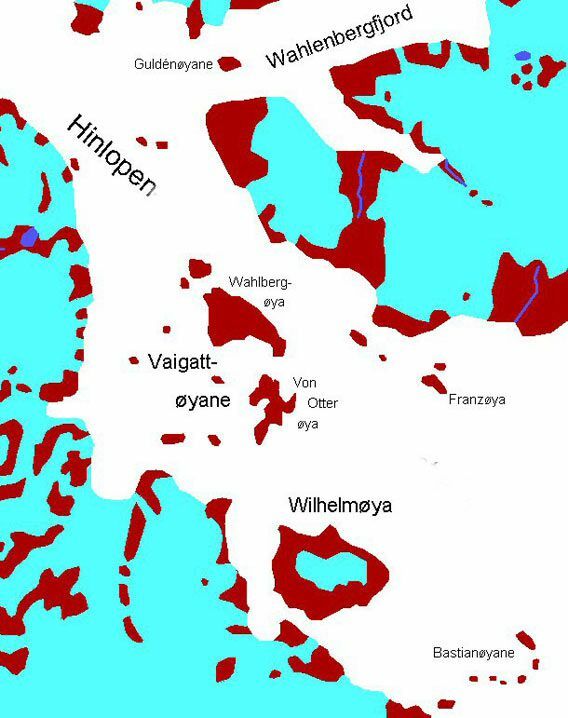 Most of the are very similar, geologically and topographically, with the exception of Wilhelmøya that is quite different. 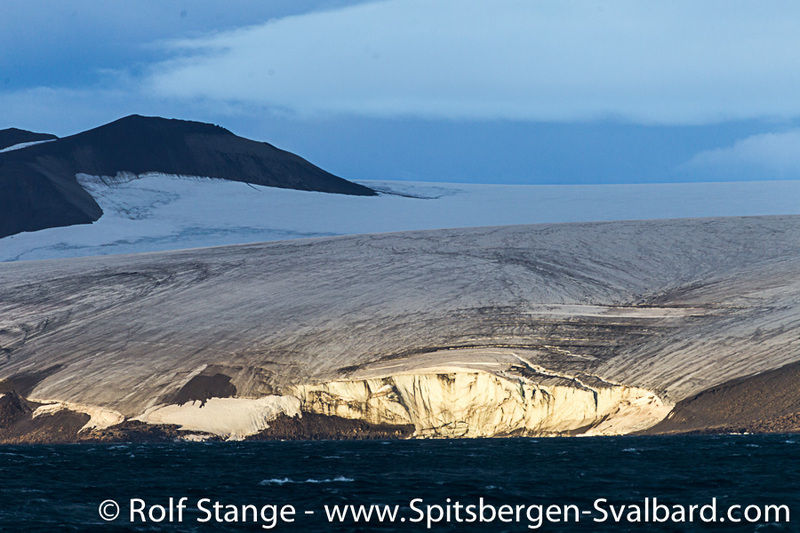 The coastlines often form steep cliffs, but it is possible to land on most of the islands except for some of the smallest ones. 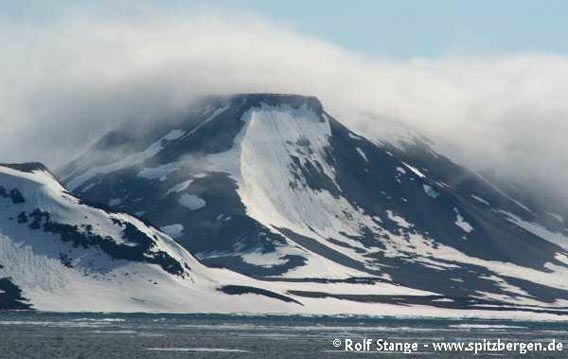 The advantage is that there is often a lee-side where landings can be made when other coasts are inaccessible due to strong wind and waves, but keep your eyes well open for drifting ice and bears. 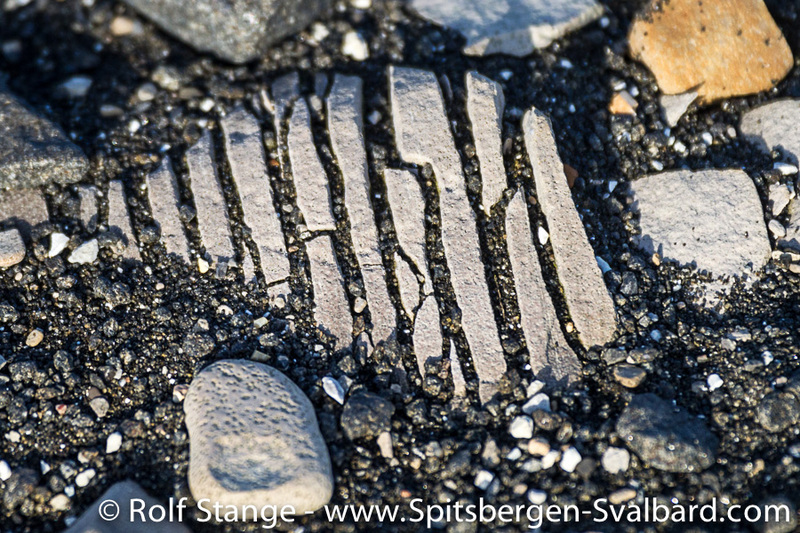 Some of the dolerite islands can be difficult to walk on, and on Wilhelmøya, solifluction soil can be extremely muddy and sticky. 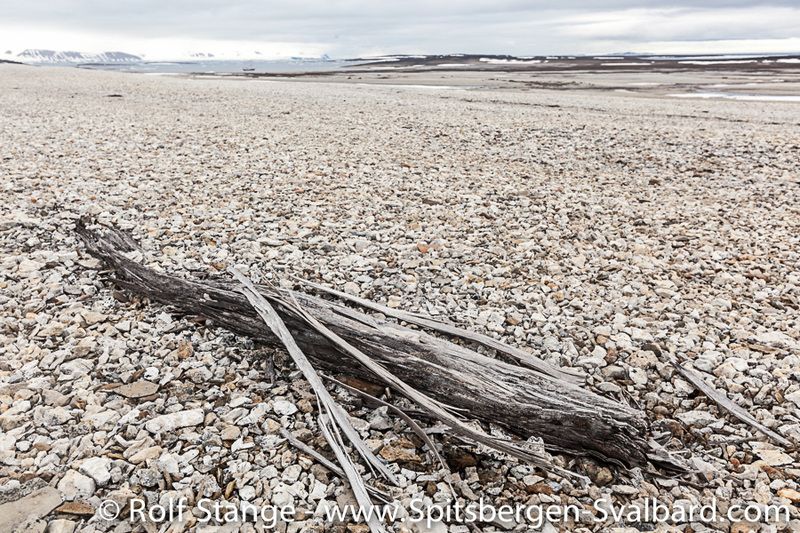 Drift ice, ice-covered shoreline and barren tundra on Nystrømøya. 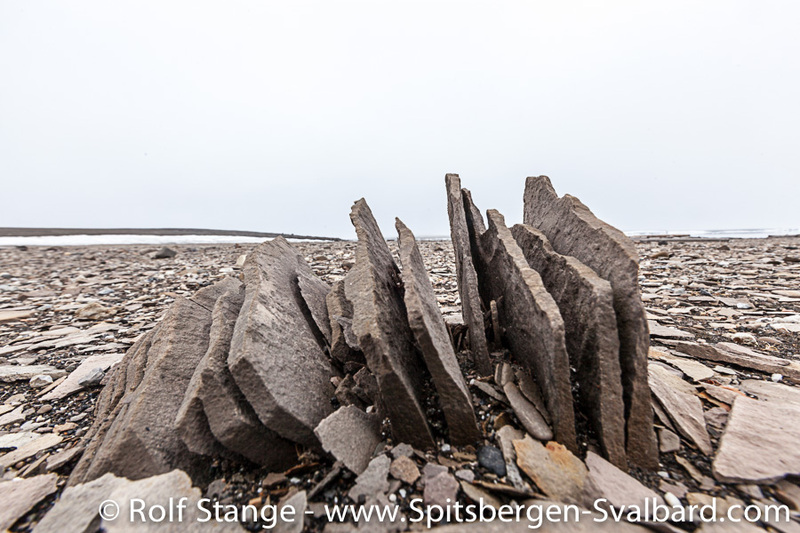 Geology: Mostly dolerite (Jurassic/lower Cretaceous), occasionally remains of older carbonate sediments (Permian; especially on Wahbergøya). 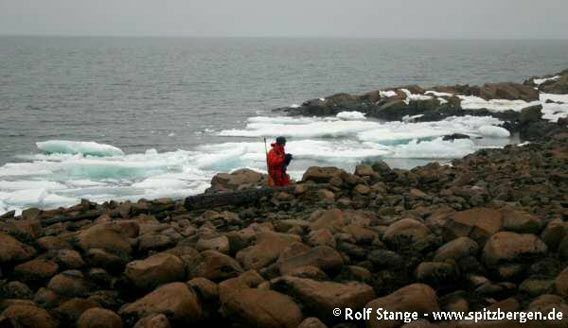 Coarse dolerite boulders can make walking difficult (Franzøya). 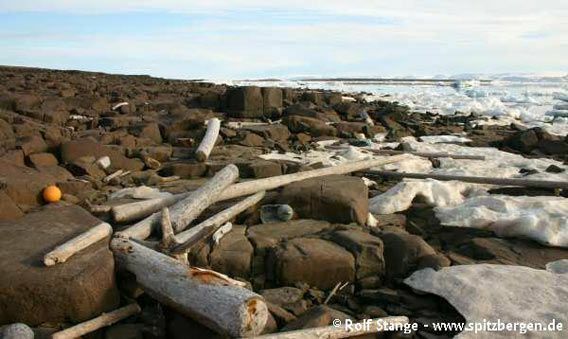 Wilhelmøya is the exception to the rule and consists of horizontal layers of Jurassic sediments. 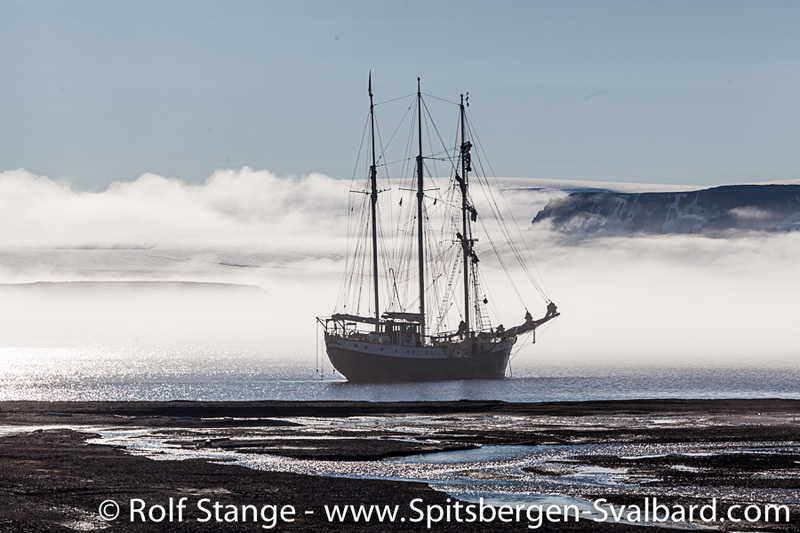 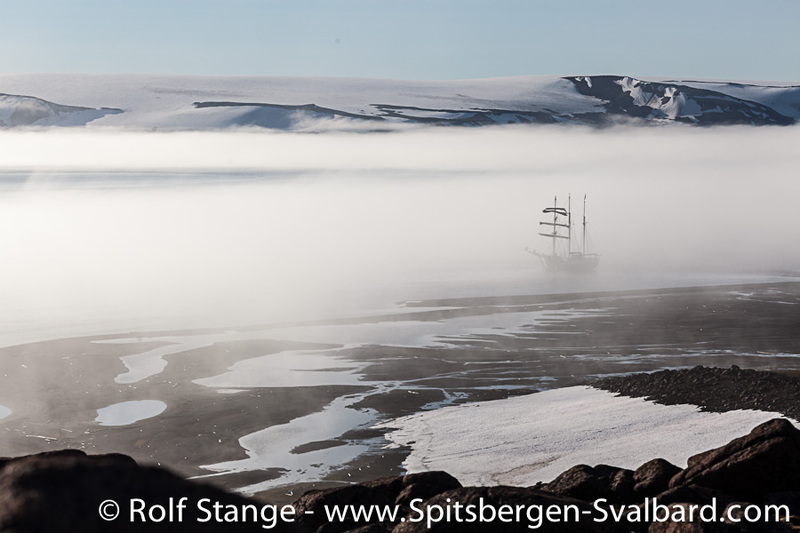 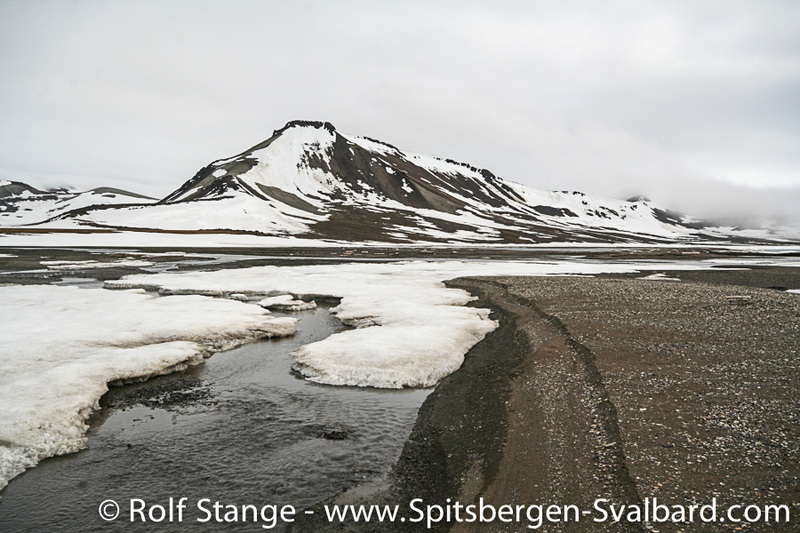 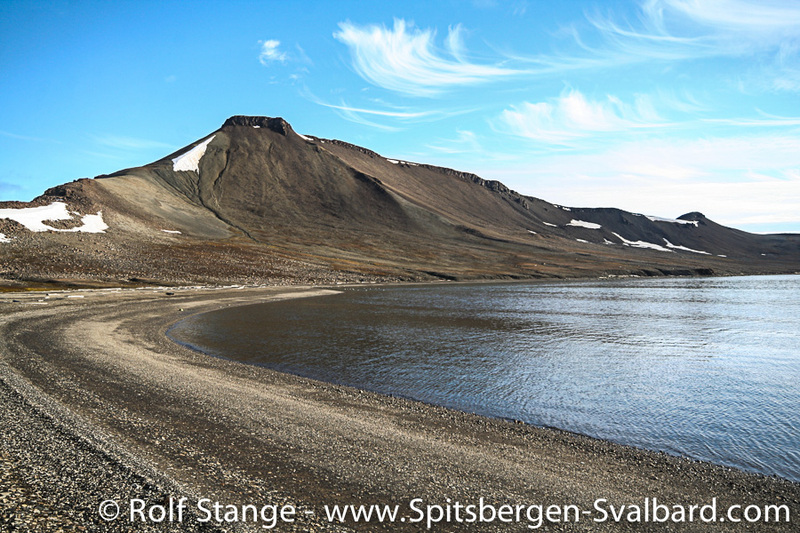 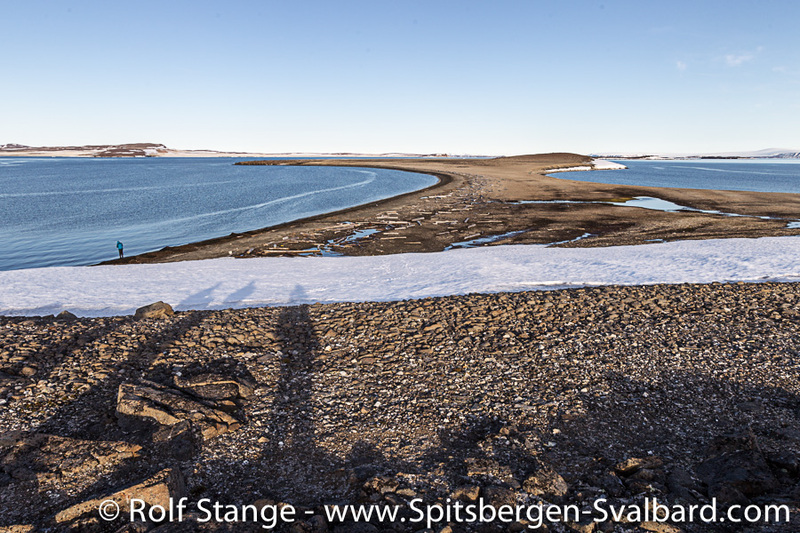 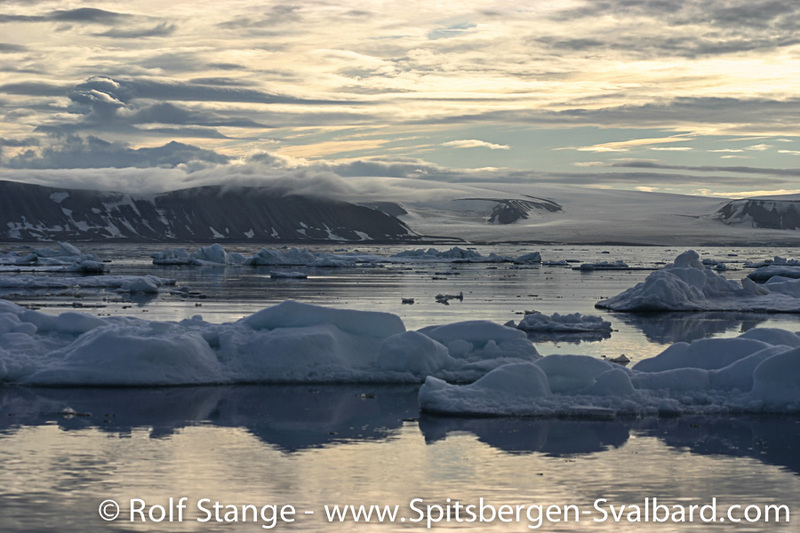 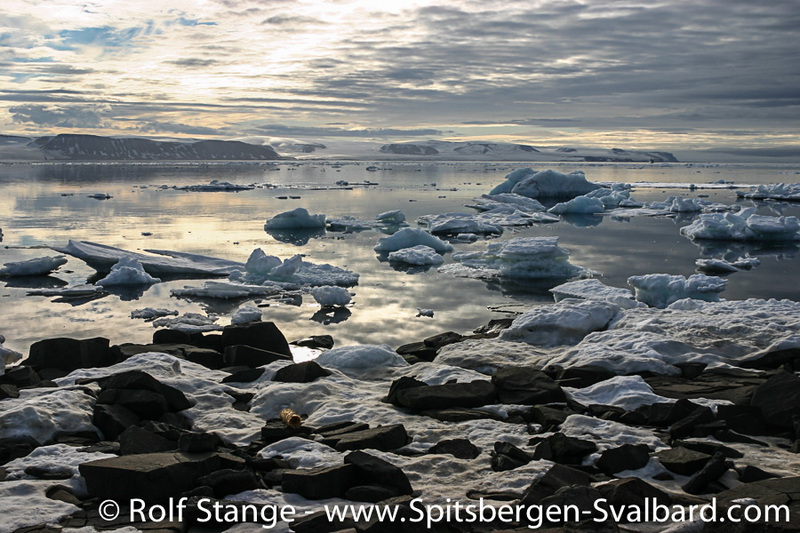 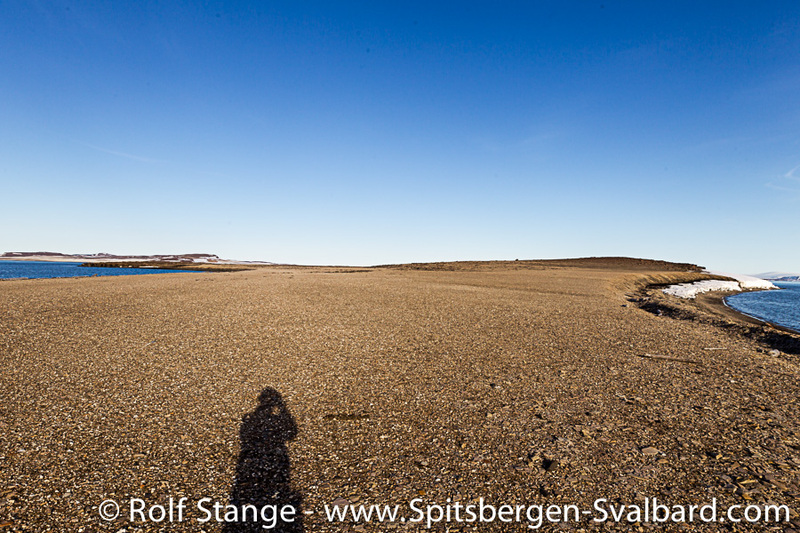 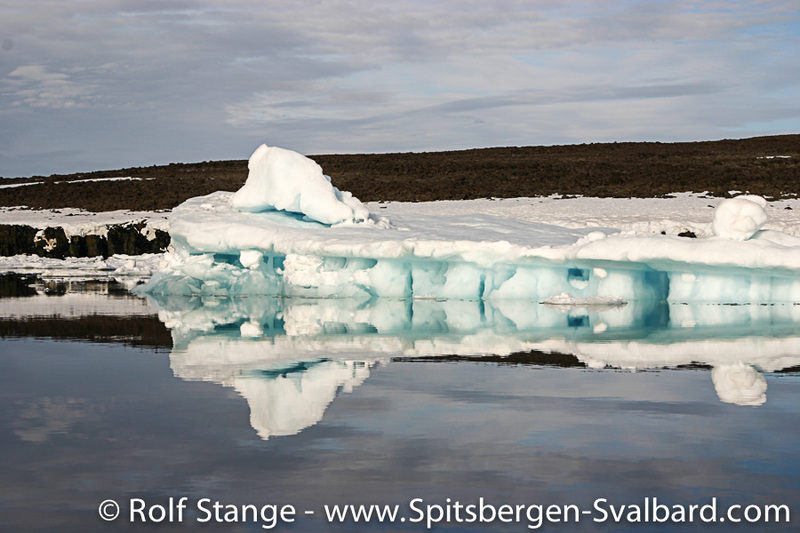 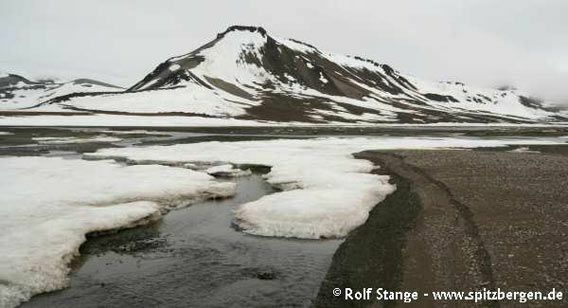 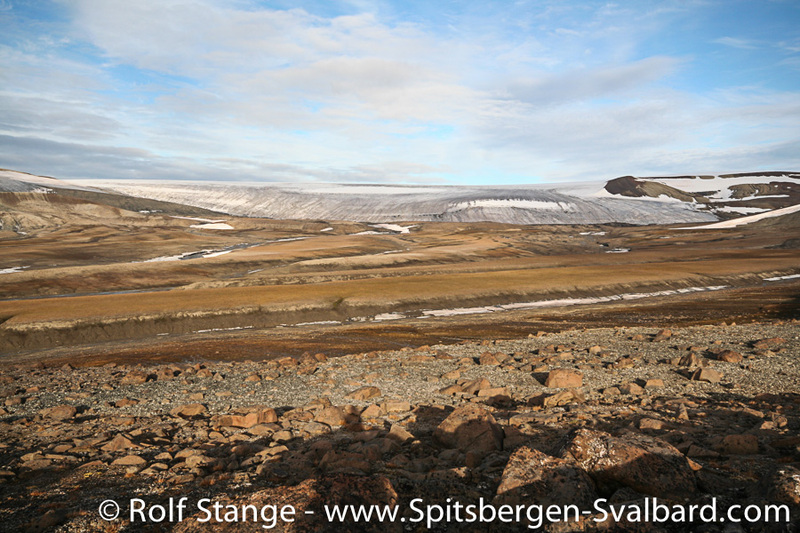 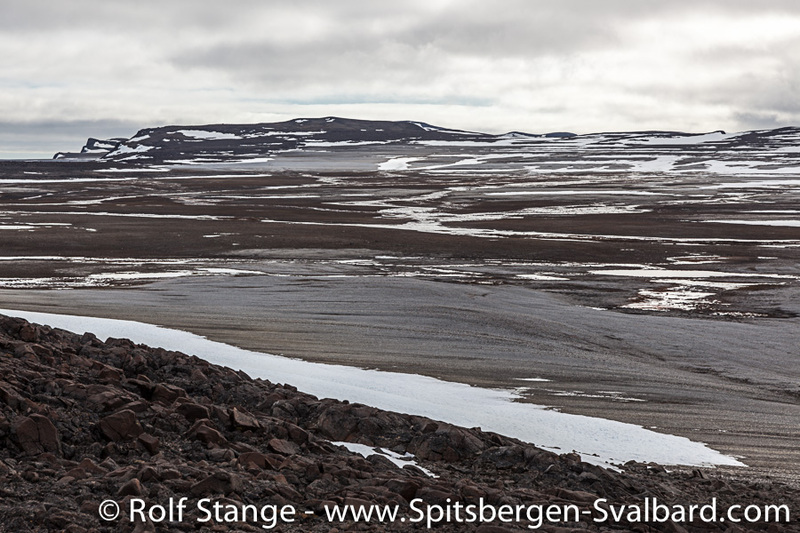 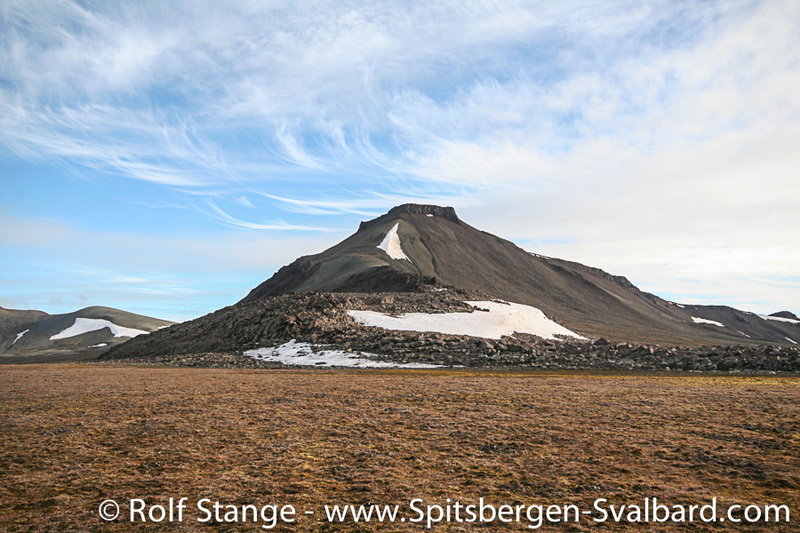 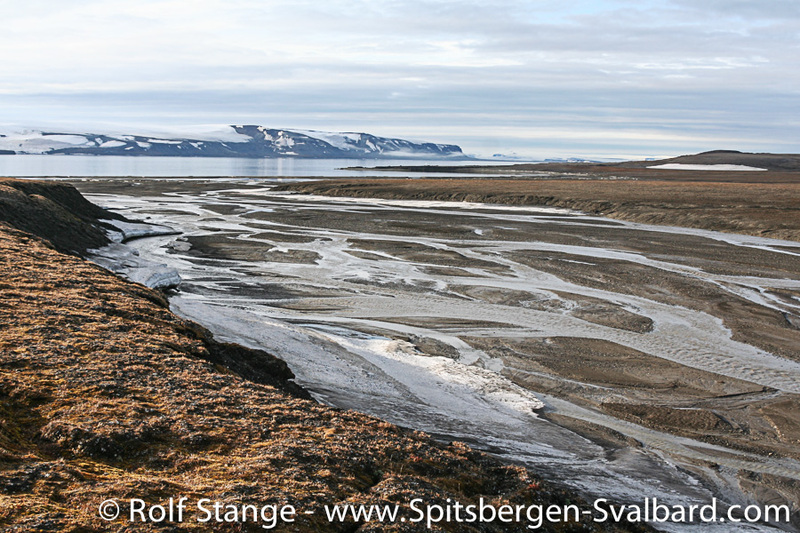 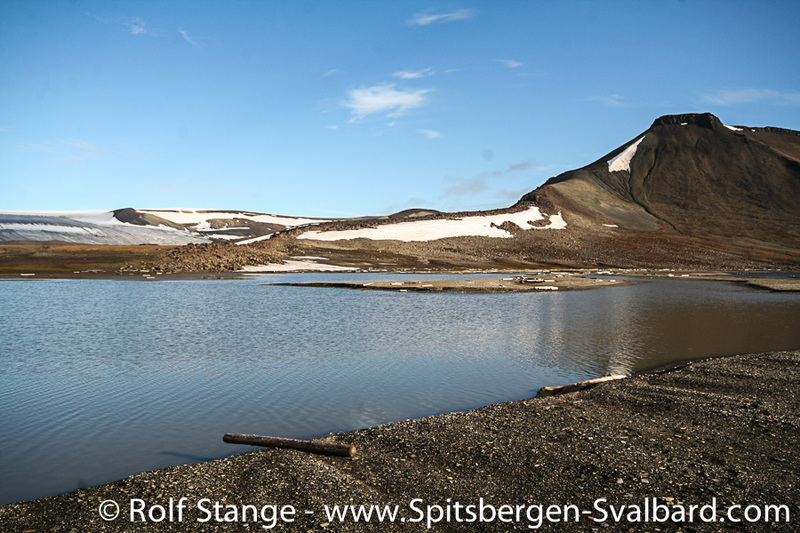 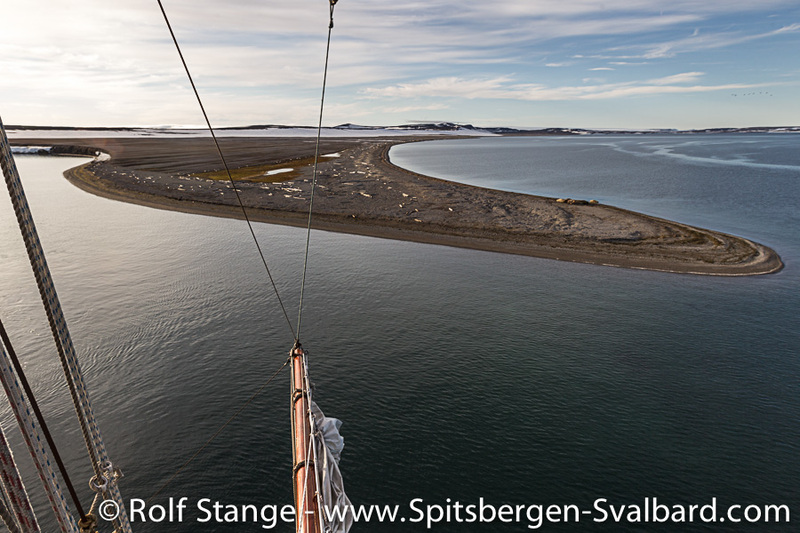 It can be looked at as the northern outlier of the Mesozoic platform of southeastern Svalbard (Barentsøya, Edgeøya). 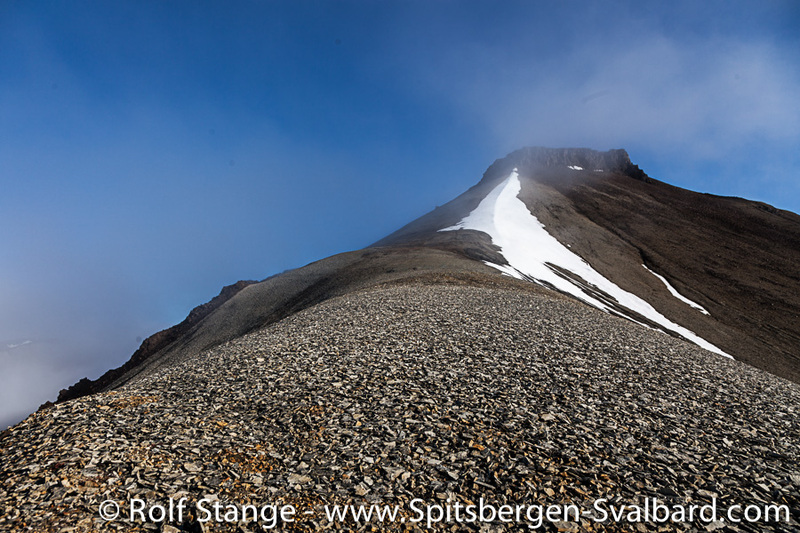 Also on Wilhelmøya, the protruding capes and flat mountain tops usually consist of dolerite. 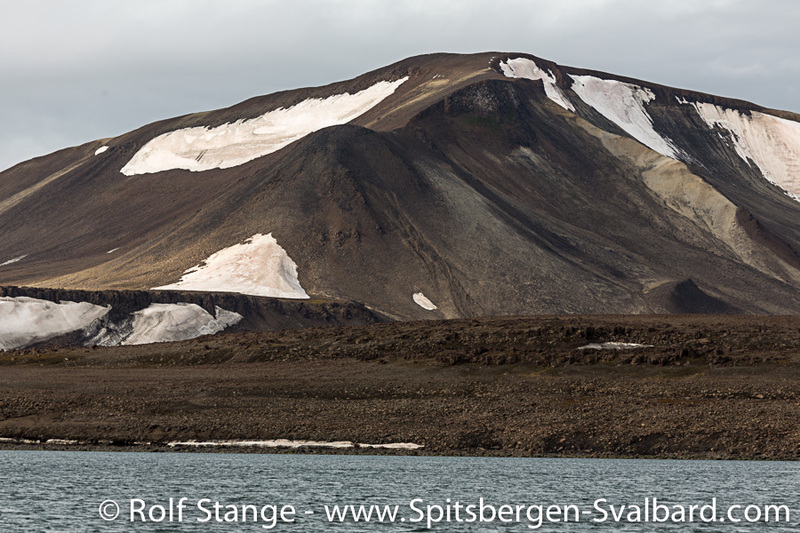 Mountains of Jurassic sediments with cover of former dolerite sill. 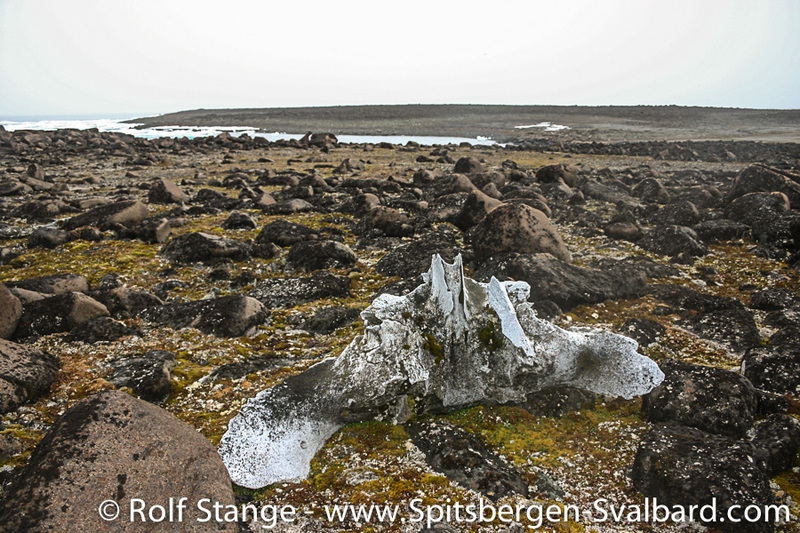 Old whalebone, mosses and lichens in dolerite tundra (Franzøya). 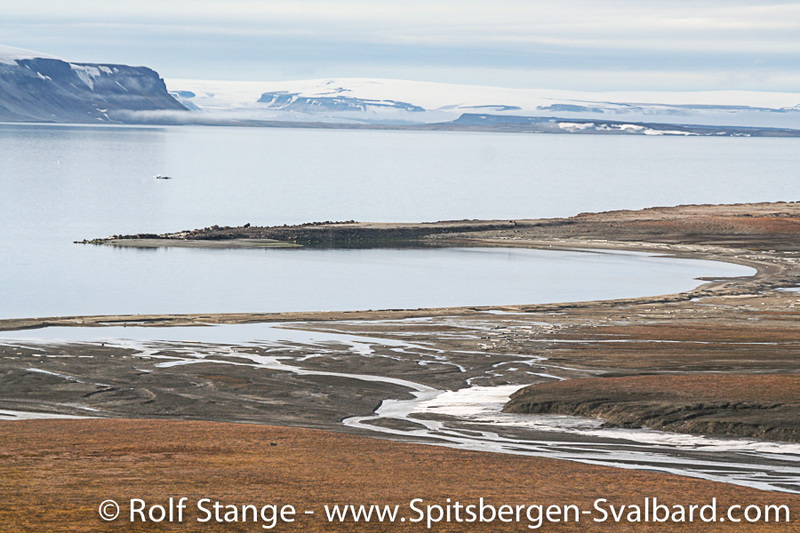 Landscape: Most of these islands are barren and rocky. 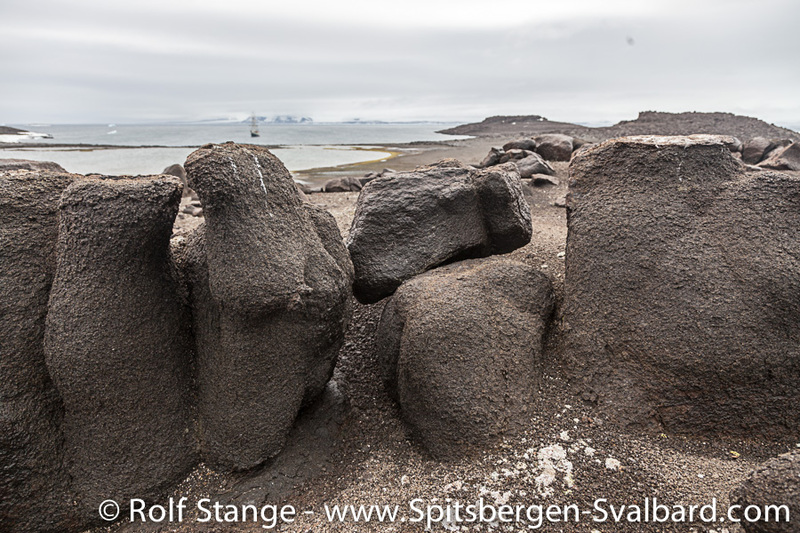 Large dolerite boulders make walking difficult in many places. 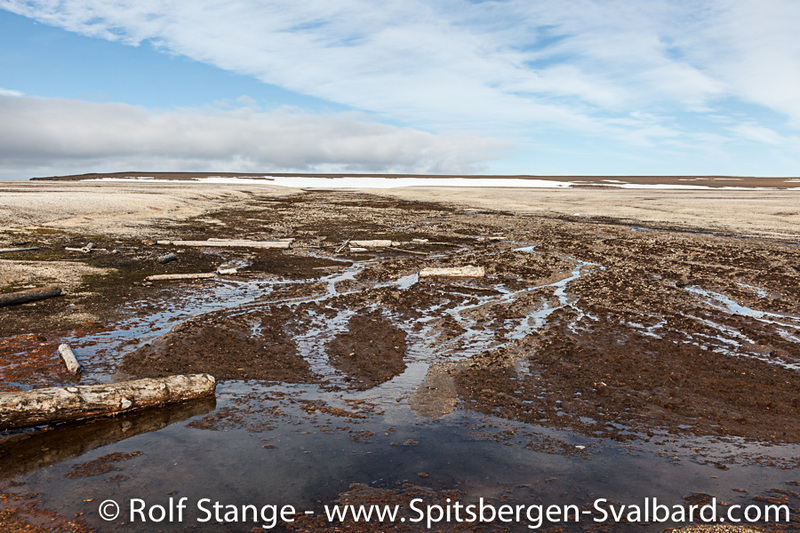 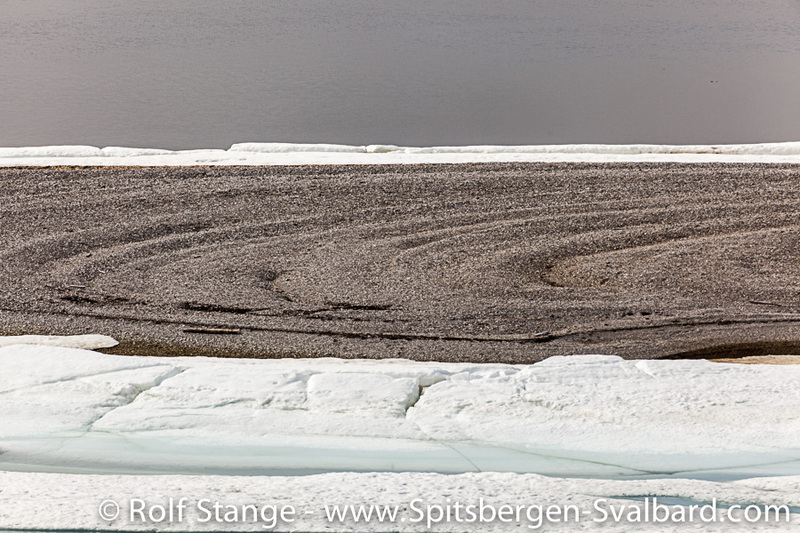 Many slopes on Wilhelmøya are covered with very muddy, sticky, deep solifluction soil which should be avoided. 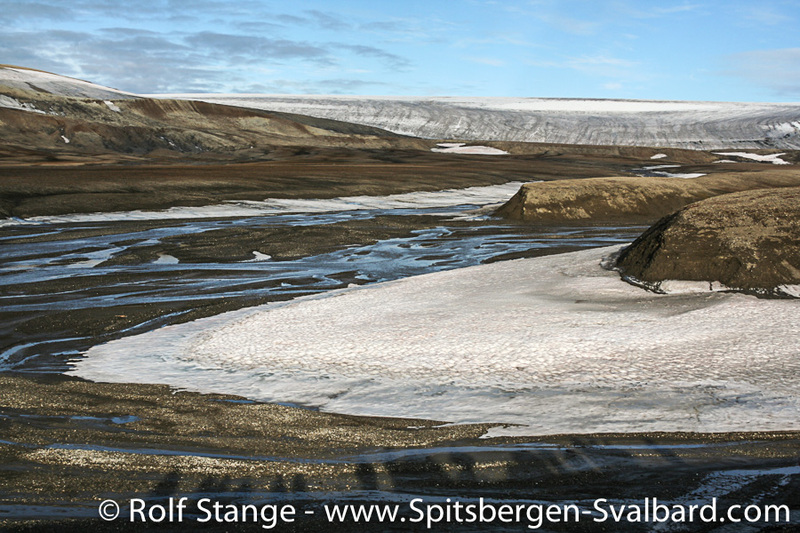 The light-coloured Permian limestone provides the easiest ground to walk on, if present. 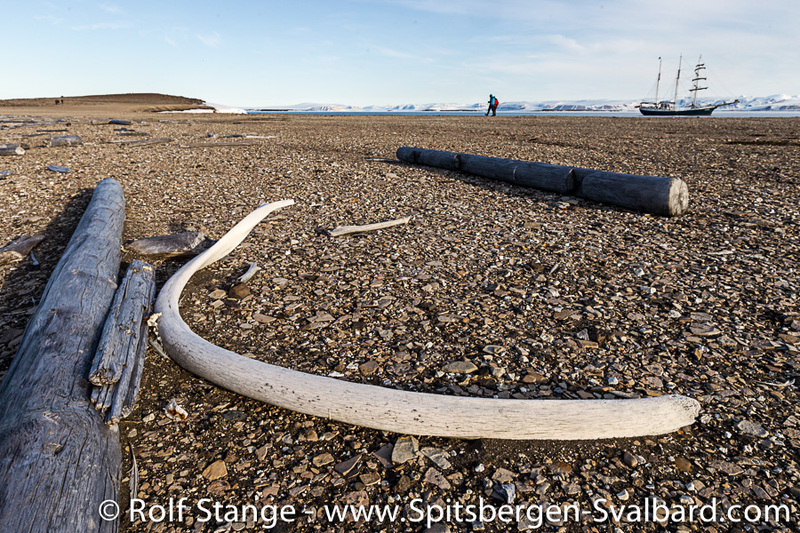 On level ground which is not covered with large boulders, you can often find fascinating displays of arctic landscape details such as frost patterned ground, fossil beach ridges with old whalebones and so on, so there is always something interesting to find. 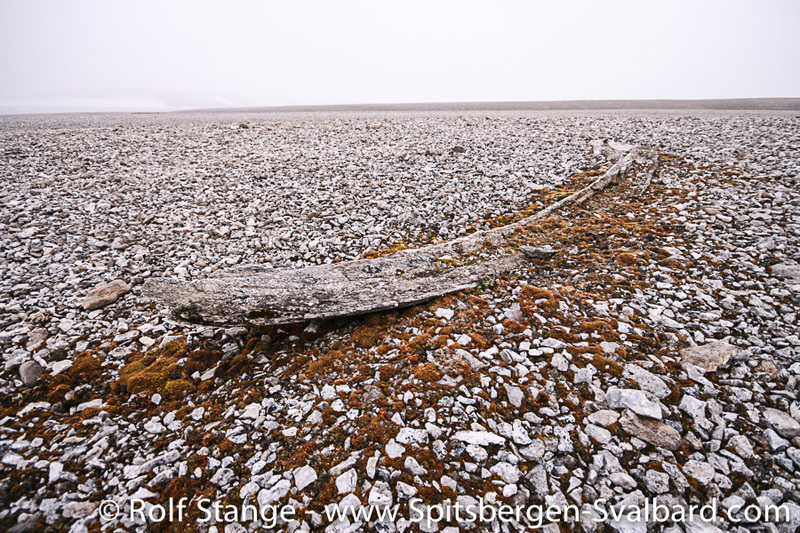 Driftwood on the coast of Nystrømøya. 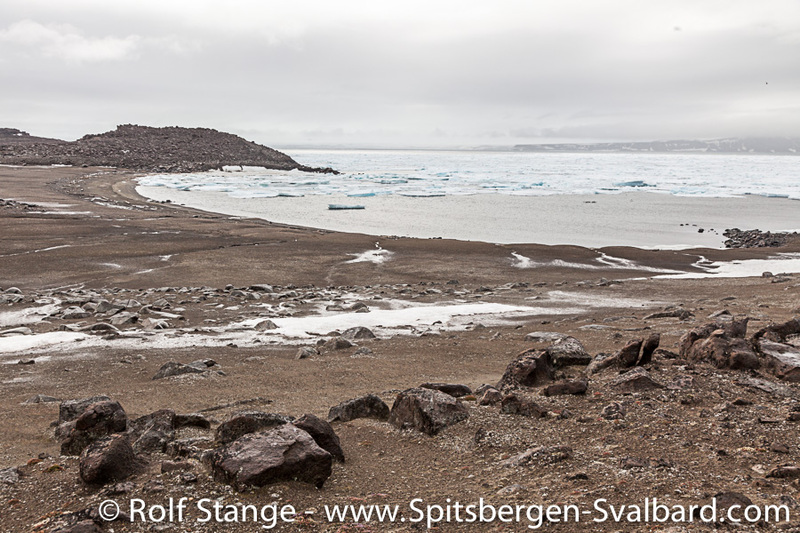 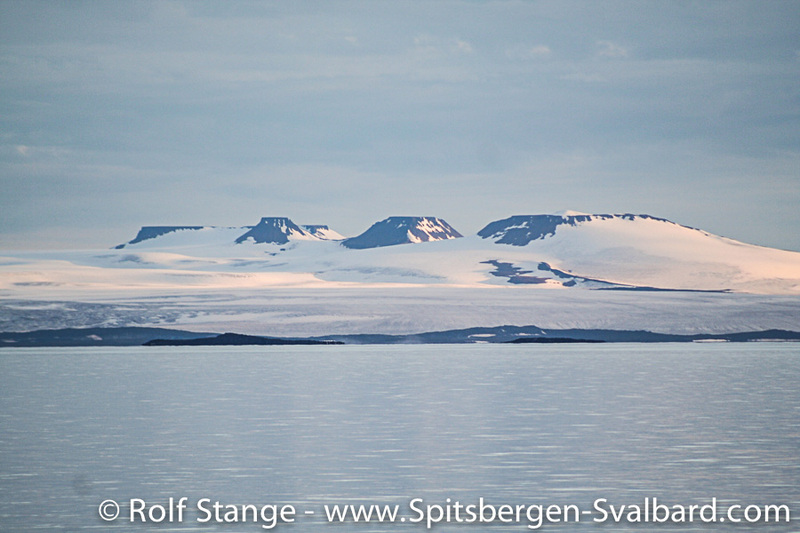 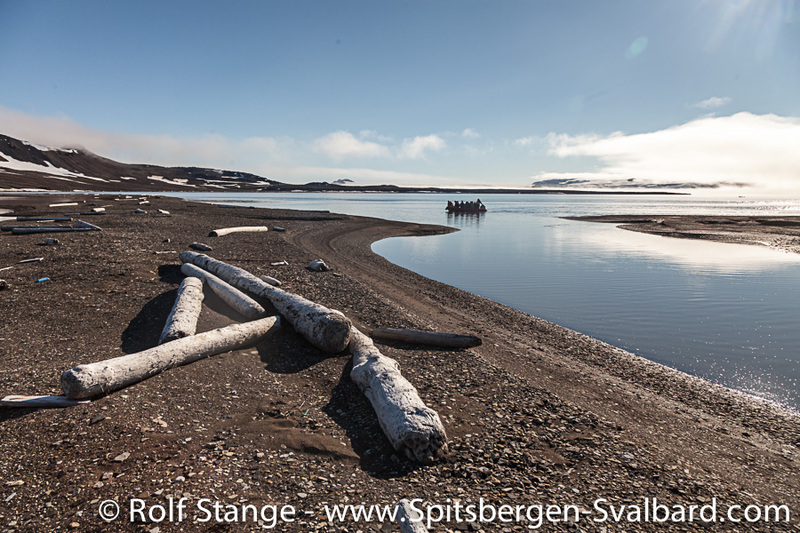 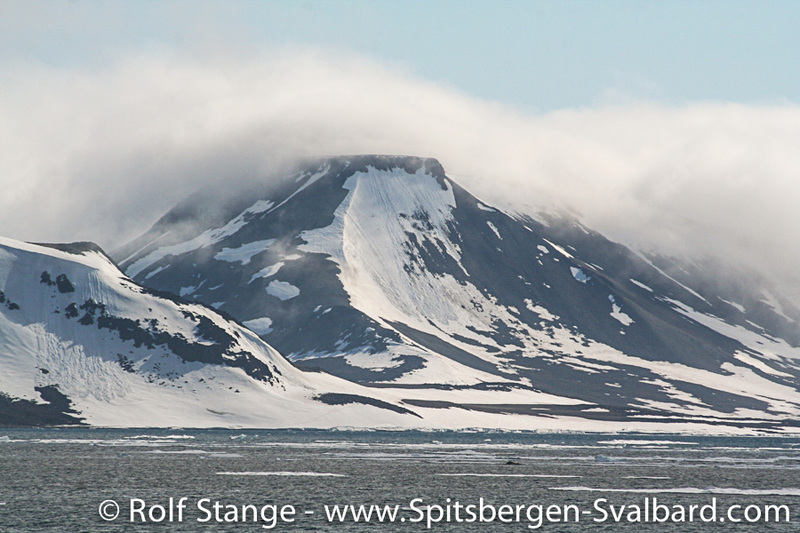 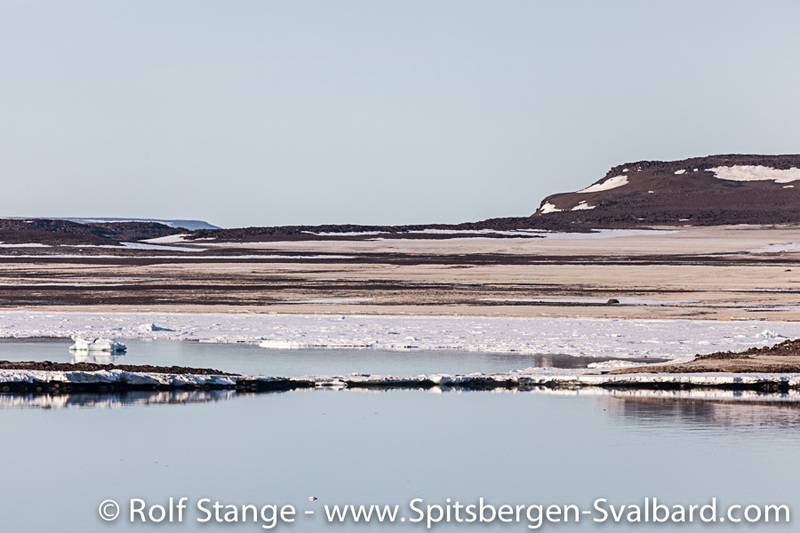 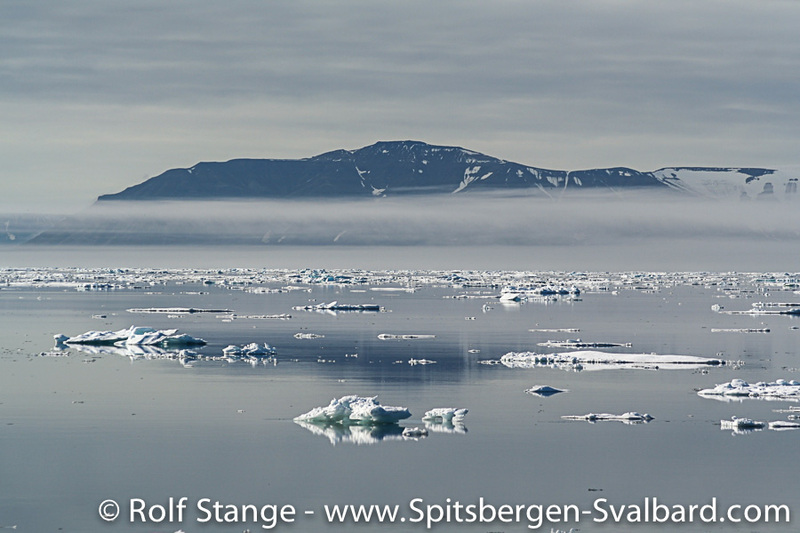 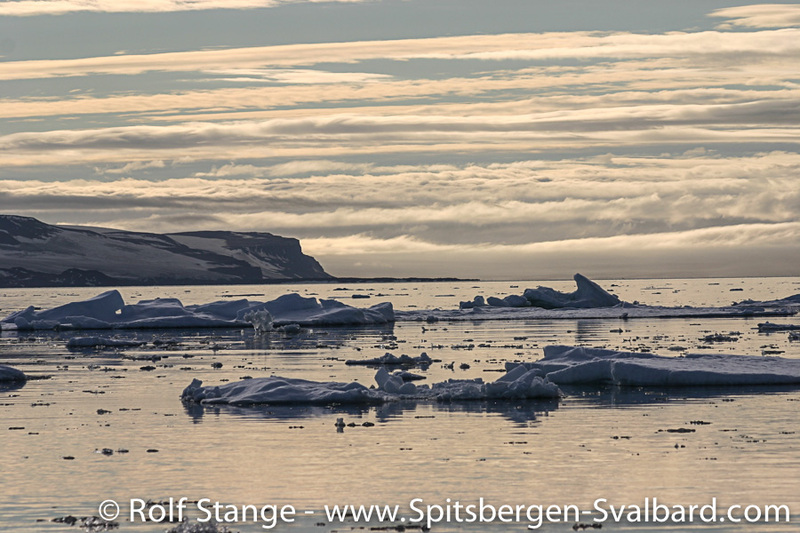 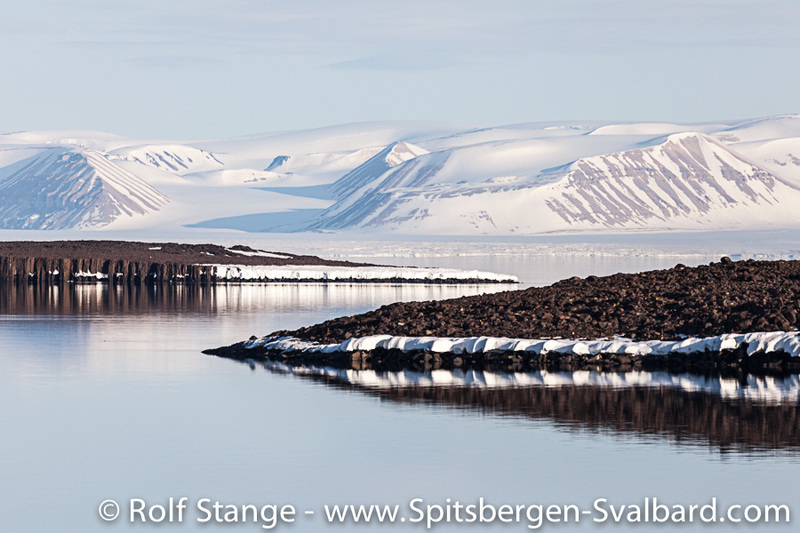 Wilhelmøya is the largest island in Hinlopen and the only one that has some mountains and valleys; here, the scenery reminds in some places of Franz Josef Land further east. 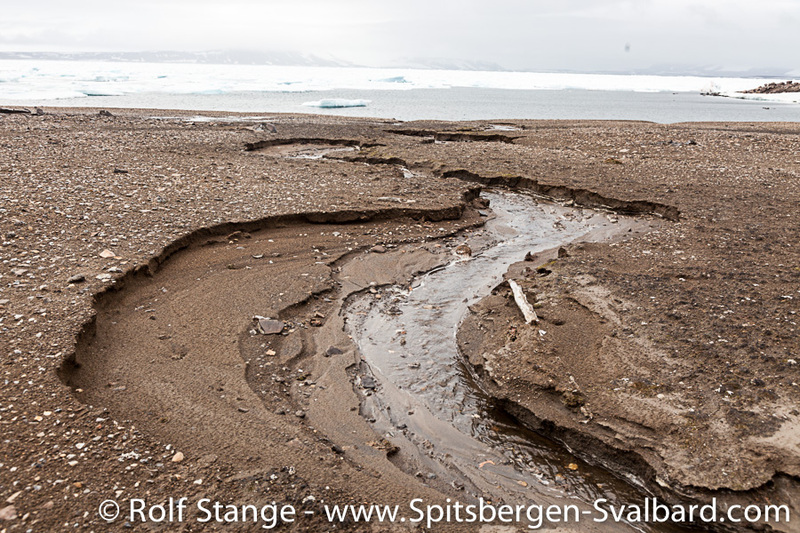 As mentioned, weathered Jurassic sediments can be soft and muddy and should be avoided. 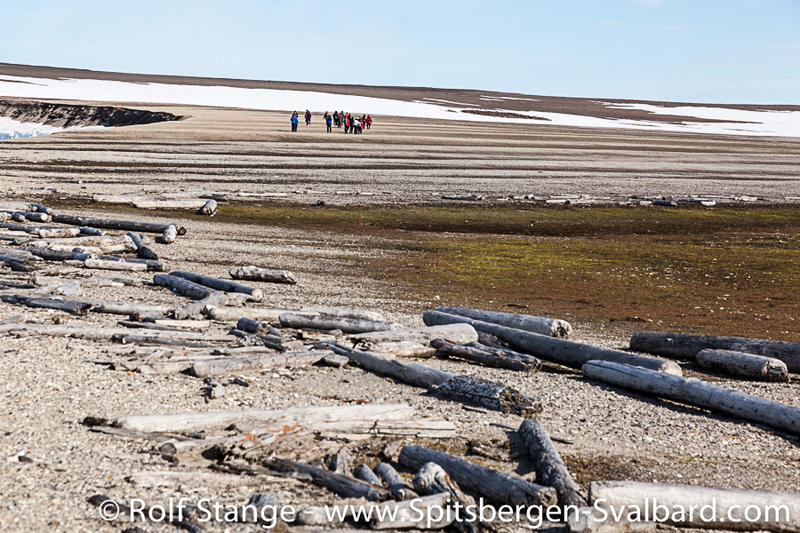 Barren tundra with some lichens and mosses (Guldénøya, Wahlenbergfjord). 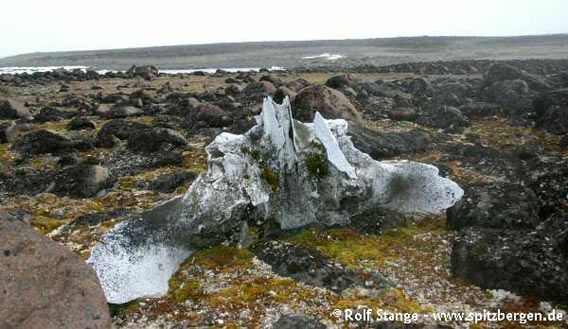 Flora and Fauna: There is very little vegetation in most areas, but in some spots you can find surprisingly rich carpets of colourful mosses and lichens. 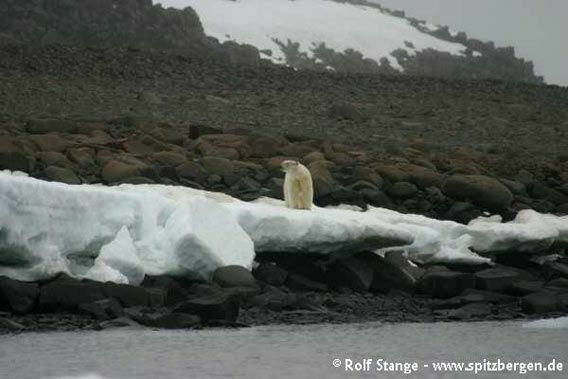 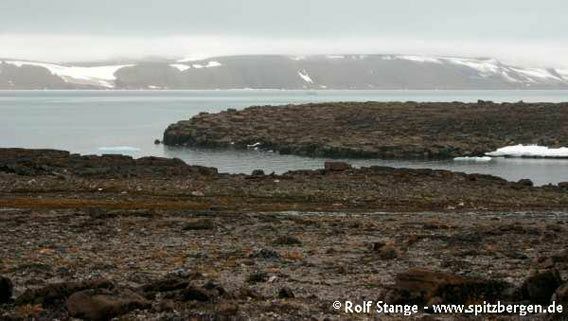 There are no reindeer, but there are places where walruses creep ashore to rest, and it is not uncommon to find polar bears on these rocky islands. 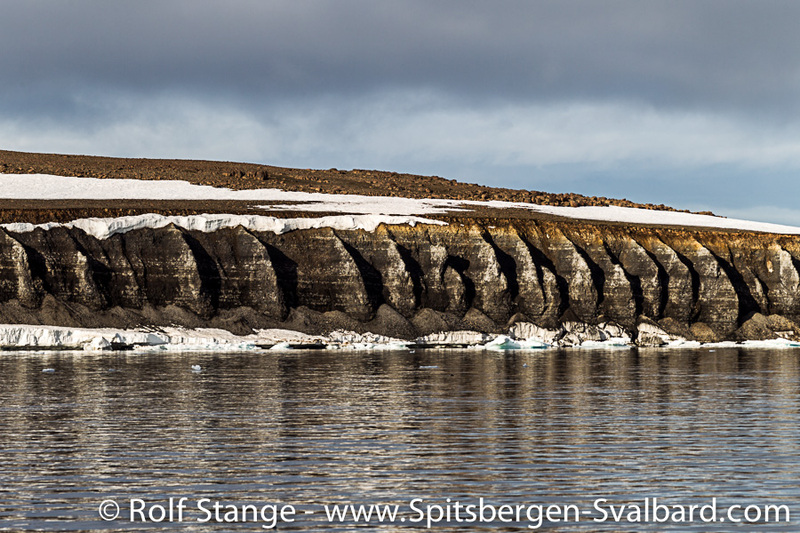 Some Brünich’s guillemot colonies on steeper cliff sections. 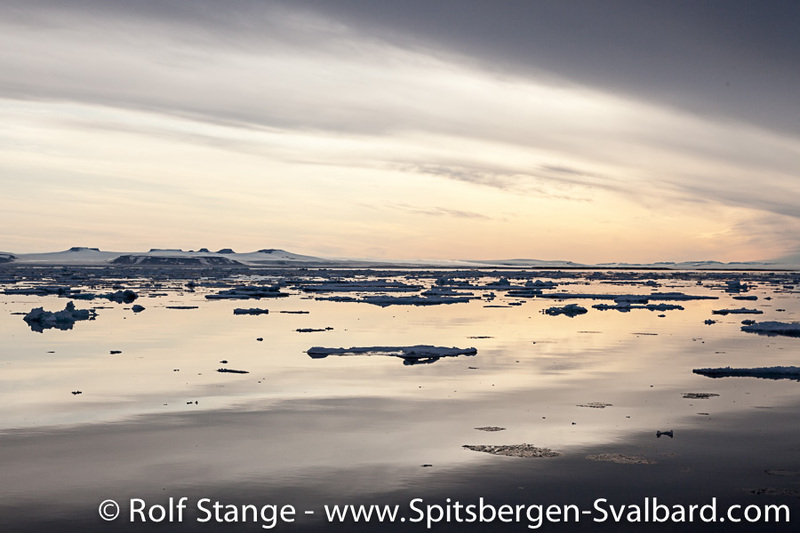 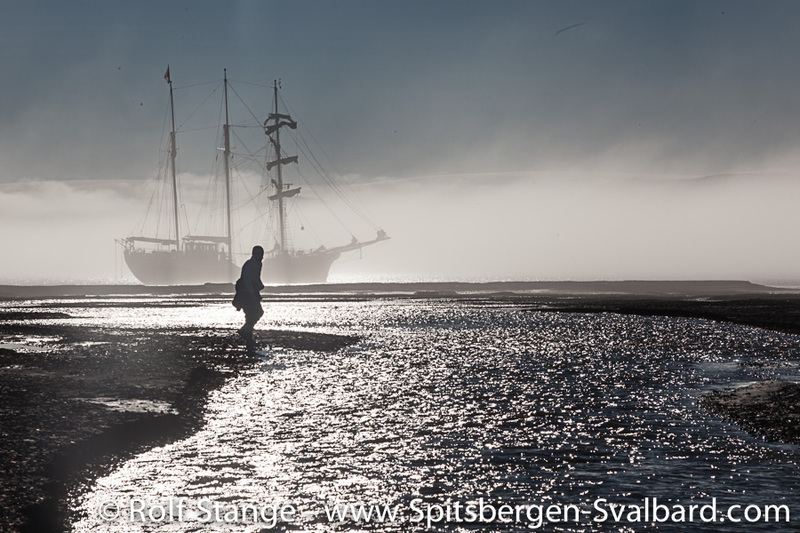 The king of the arctic himself visiting Franzøya. 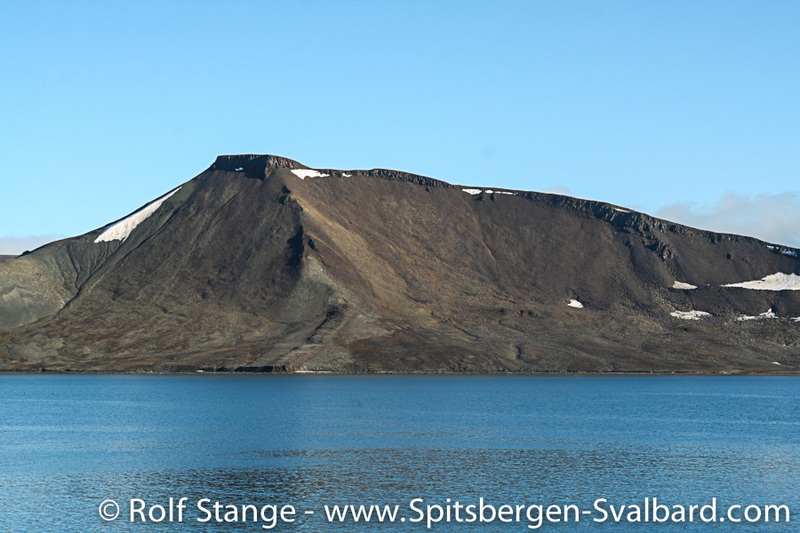 History: Most of the scientific and hunting expeditions that went into Hinlopen also visited one or several of the islands, including the famous Swedish explorer Adolf Erik Nordenskiöld. 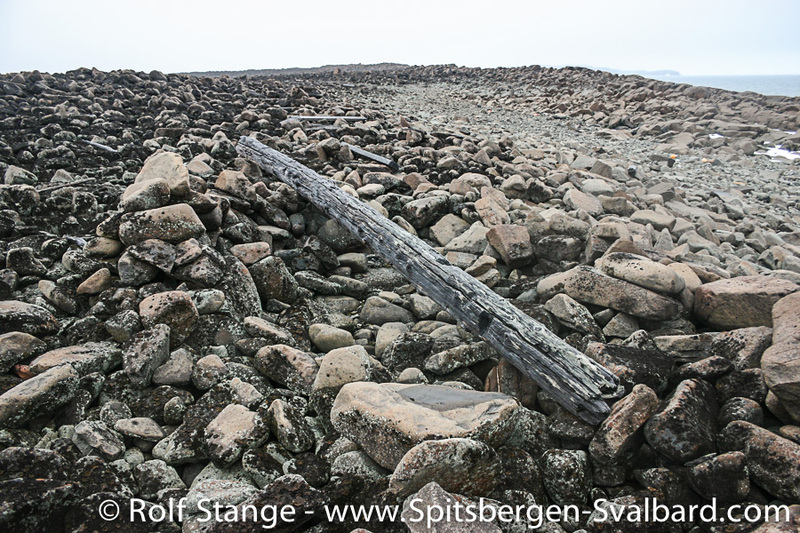 The Swedish branch of the Arc-de-Meridian expedition mapped Hinlopen 1899-1904 and built cairns in many places, a lot of which can still be seen. 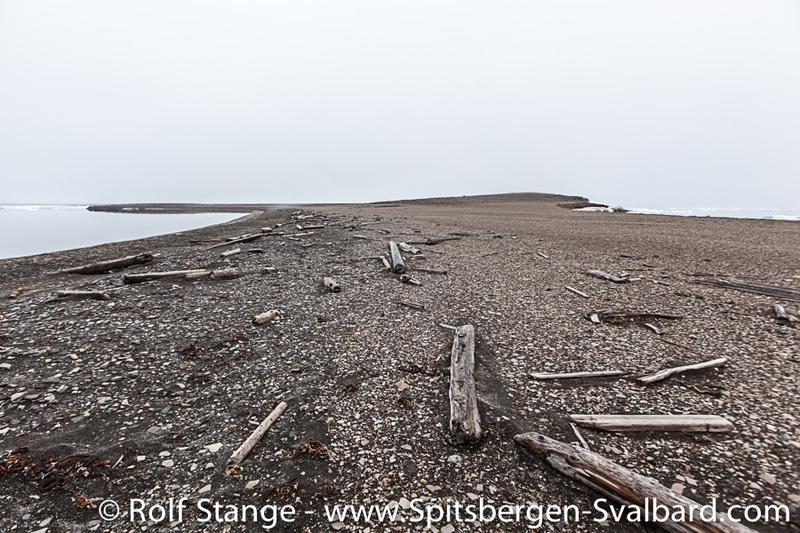 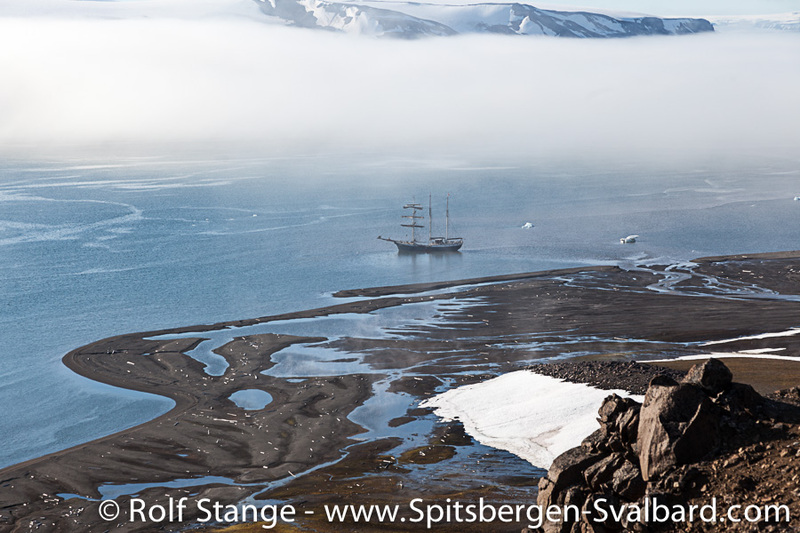 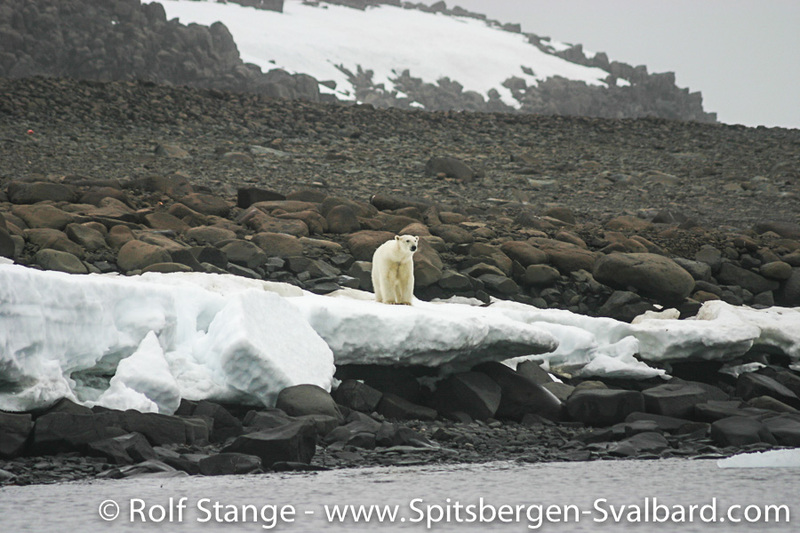 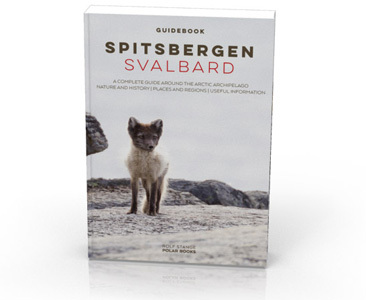 In more recent years, Kiepertøya which belongs to the group of Bastianøyane was the site of a tragedy when insufficiently armed crew members of a small ships went ashore for a walk and were attacked by a polar bear. 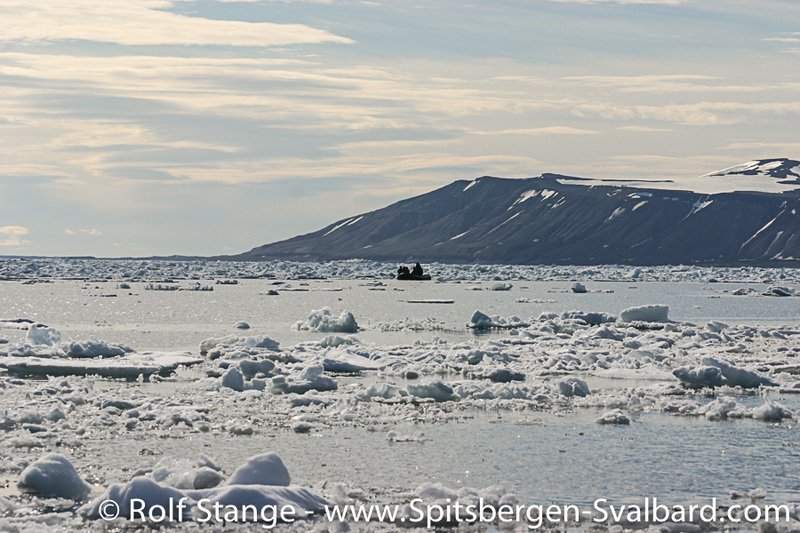 One man was killed and another one badly injured. 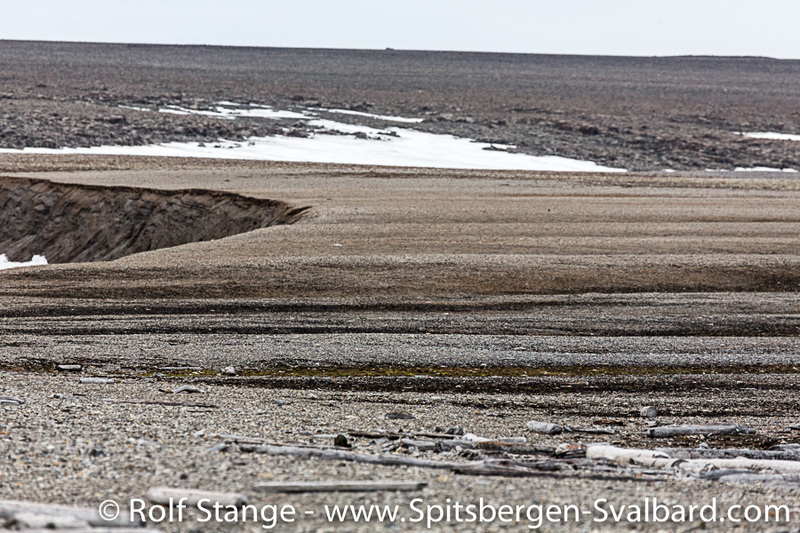 The bear was later shot.